After Recueil des croniques d'Engleterre, vol. 1 Master of the London Wavrin. 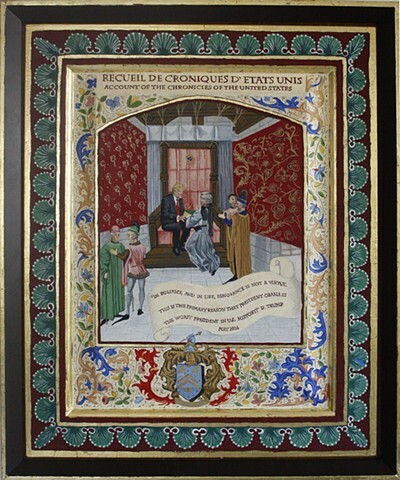 c.1470s Provenance: Edward V.
Recueil des croniques d'Engleterre, (The History of England), written by Jean de Wavrin. Presenting Trump with the History of the United States is Noam Chompsky and to his right is Paul Ryan laughing with an unidentified MOC. In the lower left is VP Pence speaking with Mitch McConnell. In the bottom margin please note the Trump coat of arms.